I just love cooking with my boys! It’s amazing the number of ways they contribute to the development of better tasting recipes! Here are three recipes you can create at the same time that are certain to not only save you time, but also give you and your family some delicious healthy options for three favorite traditional comfort foods! And they freeze great too, so don’t risk turkeying-out your family by serving all three in the same week! T3 is the result of an “ah ha” moment during a cooking session with my youngest son. 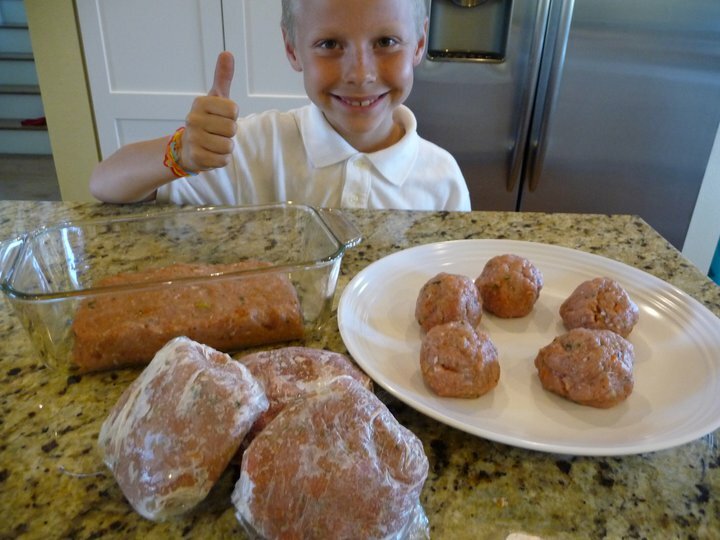 We were making our usual turkey-veggie burgers and meatballs together (which I thought was such a brilliant use of time), when he said, “Mom, why don’t you try making a meatloaf out of this stuff?” This kid is a genius! Thus, T3 was born! Since then, we now happily squish and squash our ground turkey into these three wonderful concoctions and freeze it for those days when we’re craving some good old-fashioned comfort food! Yet another reason why I truly believe getting your kids in the kitchen is such a wonderful blessing! So here’s how T3 works … it’s as easy as 1, 2, 3! 2) Divide the massive meat-mixture into three relatively-equal portions. One portion will be for your burgers, while the other two portions will be used to make the meatballs and meatloaf. 3) Just add the remaining ingredients to the two portions dedicated to meatballs and meatloaf, as outlined in the recipes, and you’ve got T3 – three delicious meals ready to go! Now that’s what I call a time saver! Hi Kelly! Let me just say you have become our family’s best friend and I don’t even know you!! I prepped all 3 turkey recipes this past weekend and so far we have had the hamburgers and the meatloaf and my family raved about both! We had company over when we had the meatloaf and they were shocked to find out it was turkey and had veggies in it. “Best meatloaf I’ve ever tasted” was the general comment around the table! I can’t thank you enough for all the hard work you put into sharing these recipes and your blog with us! I have tried many of your recipes over the last two weeks and my very picky family is raving over the recipes! The only one that didn’t come out as great were the homemade crackers but I think I goofed. They flavor was delicious but everyone would said they were to soft and not crispy like a cracker. I think I made the dough too think and I forgot to leave the oven open a bit at the end. Sorry, I wrote so much, but I had to thank you!